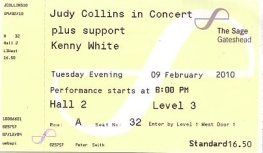 Last year I bought a couple of old Judy Collins albums at a local car boot fair. When I got home and played them I realised how beautiful her voice is, and how important she was in the 60s US folk movement. I’d only been aware of Send in the Clowns and her version of Joni Mitchell’s Both Sides Now but listening to those albums, and some web surfing, soon made me realise that there is much more to her than that. She was, of course, the inspiration for Stephen Stills’ Suite Judy Blue Eyes, and a friend of all the major folk rock stars in the 60s. I’d never been to see Judy in concert before. She played at the Sage a couple of years ago and I didn’t make it, so I was pleased to see that she was returning, and bought a ticket. The concert was in the smaller hall and had been sold out for some weeks; there are still a lot of people who want to go along and see her. I missed the support and arrived just in time to grab a drink before the show. Judy came on stage at around 8.50pm. She looks great, her hair is white now (she is over 70 years old) and her voice is as clear and sweet as ever. She intersperses the songs with some tales of her life in the 50s and 60s. How she met Barbra Streisand before she hit the big time, and how she was a friend of Leonard Cohen and he came to her house and sang Suzanne to her before he recorded it. With her acoustic guitar and accompanied by Russell Walden on grand piano, her wonderful voice filled the small hall and captivated all of us. The songs were a good mix of old folk songs and ballads, and included, of course, Both Sides Now, Send in the Clowns, the Beatles Blackbird, Cats in the Cradle and a lovely version of Over the Rainbow. A great way to spend a Tuesday evening in the company of a true legend, whose voice is as clear as it is on the old albums that I have (and without the scratches and clicks). I can only begin to imagine what it must be like to have lived such an exceptional life, and to continue to travel the world, singing great songs to people.